This verse is understood to mean that the first arab (evening) is the last part of the ninth day and that the Sabbath continues until the last part of the tenth day (inclusive). Two periods of arab are therein identified and the idea that byn ha-arabim (between the evenings) is in the afternoon was born. This verse has been vowel pointed to read this way by orthodox Jewry at least since the fifth century C.E. and is found in the LXX (the earliest copy of this passage which only goes back to the 4th century C.E. ), which was clearly influenced by Pharisaic scribes. For this reason the interpretation has been generally accepted. Yet, a closer look shows that this interpretation came about, in part, because something like it was already desired by the rabbis and Talmudists in the effort to support the rabbinical view of arab and byn ha-arabim. To begin with, in Scriptures we are commanded to have at least two witnesses.3 However, there is no reference found in any other scriptural statement either like or similar to this Pharisaical understanding of arab. 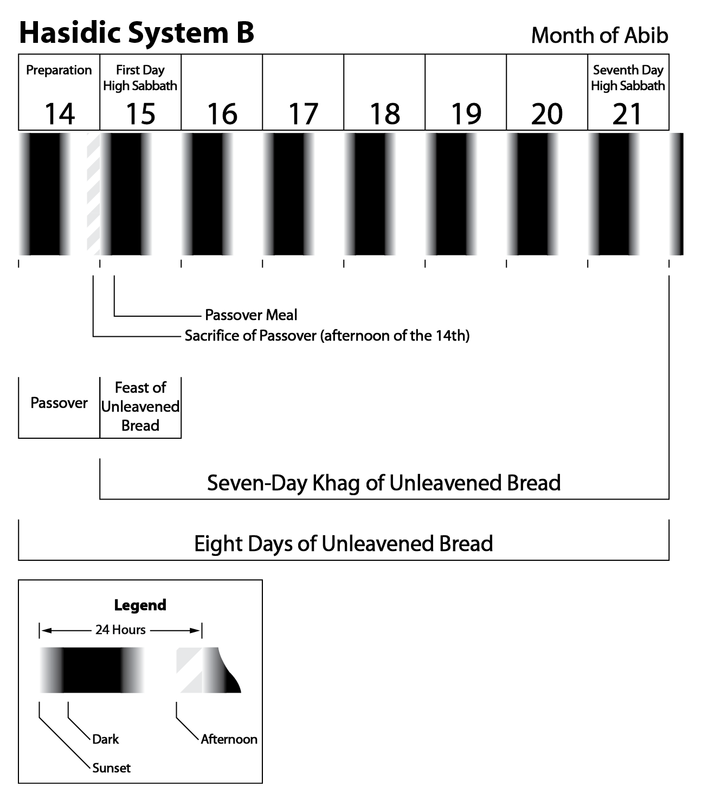 That the date of Yom Kippur (Day of Atonement) is on the tenth day of the seventh moon is testified to in Leviticus, 16:29-34, and Num., 29:7-11. ON THE TENTH of the same lunar moon they fast until ἑσπέρας (esperas; twilight)4 (exclusive dating). Yet, nothing is said by any of these other works that this fast begins with the last hours of the ninth day! The high priest would not eat much, but on the last part of the ninth day he did eat! Therefore, they believed that the fast began at dark, i.e., after sunset, and at the beginning of their understanding of the tenth day. As a result, for the interpretation of Leviticus 23:32 to work “from arab,” exclusive dating must be used. But this understanding would clearly contradict the plain statement of their interpretation that the fast was to begin “בתשעה (be-tishah; within the ninth)” day of the moon. It is a Sabbath of rest for you; and you shall humble your nephesh (life) בתשעה לחדש בערב (be-tishah la-khodesh be-arab), from arab to arab you shall keep your Sabbath. Yet, this phrase can just as easily be read another important way. And you shall humble your nephesh (life) in deliverance for renewing it within arab, from arab until arab you shall keep your Sabbath. In English thought, by humbling yourself you shall be renewed and made acceptable for deliverance. This humbling is to start with the period of arab and continue until the next arab period begins. Rather than speaking of the arab of the ninth, the passage is explaining the purpose of this humbling, a humbling which begins with the arab of the tenth (the date already being explained in verse 27). We are to humble ourselves “for renewing” or “restoring” the nephesh (one’s life) in order to be delivered or saved. From the arab (evening) of the tenth (inclusive dating) until the next arab (evening; exclusive dating) this Sabbath of fasting is to be kept. Accordingly, the evidence shows that this verse from Leviticus 23:32 can be translated two distinctly different ways. At the same time, the Pharisaic interpretation that the passage is speaking of the “ninth” day rather than one’s salvation has no supporting evidence in Scriptures. The alternate understanding, meanwhile, is supported by other scriptural verses and, after our thorough examination, there can be no doubt that the period of arab only begins a 24-hour day and never represents its last hours. These details render the Pharisaic interpretation feeble at best. Regardless of which view one takes, we once more have an arab reckoning that begins on a specific day as indicated by Scriptures. • First, the period called בערב (be-arab; within arab) is nothing less than another way of saying the phrase בין הערבים (byn ha-arabim; between/among the arabim). • Finally, the events occurring byn ha-arabim come after the first period of arab (at sunset), not before. • Arab (dusk, the intermixing of light and dark) = (1) the entire period between sunset and full dark, i.e. twilight, or (2) one portion of that period. (First) arab = the first mixing of sunlight and dark begins at sunset, just as the sun disappears behind the horizon. It begins a 24-hour day. (Last) arab = the last mixing of sunlight and dark, i.e., as evening twilight is turning into full dark. • Byn ha-arabim = between (or among) the arab periods. • Be-arab = within twilight. There is no doubt that we have gone a long way toward resolving the confusion regarding the terms arab and byn ha-arabim especially in relationship with the Day of Atonement. 3 Matt. 18:16; Deut. 19:15. 5 Philo Spec. 1:35 §186. 8 SEC, Heb. #8668; HEL, p. 262. 12 1 Thess. 5:21; Isa. 34:16; Deut. 19:15; 2 Cor. 13:1; cf., Deut. 17:6; 1 Tim 5:19; John 8:17; Matt. 18:16; Isa. 28:9-13. 13 JE (The Jewish Encyclopedia. Ed. by Isadore Singer. 12 vols. New York, KTAV Publishing House, Inc., 1964. ), 9, p. 553; FSDY 1, chap. XIV. This entry was posted on 08/24/2013, 9:08 am and is filed under Crucifixion, Day of Atonement, Easter, Feast Days, Holy Days, Passover, Scriptural Calendar, Unleavened Bread, Vernal Equinox, Yahushua, Yahweh, Yom Kippur. You can follow any responses to this entry through RSS 2.0. You can leave a response, or trackback from your own site. Bravo! It is a good study, Yahu Ranger. I thought there is no in hebrew. Should the word be yahveh?